RBTH presents a selection of views from leading Russian media on international events. Today, another tragedy rocks Donetsk, new agreement between Russia and South Ossetia will not lead to integration and Russia and China strengthen relations through a high-speed rail project. The Kommersant business daily writes that the conflict in the Eastern Ukrainian region of Donbass has reached a critical point. Yesterday Kiev admitted to having lost the strategically important Donetsk Airport, ending for now a battle that had lasted 242 days (link). However, the fact that the pro-autonomy forces have now gained control has not stabilized the situation. 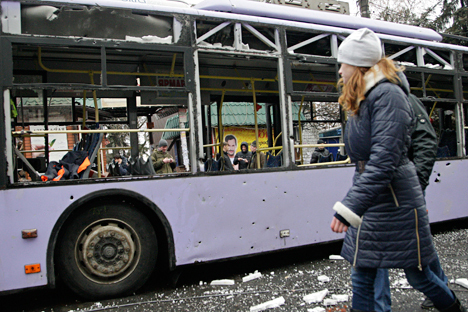 In Donetsk more than 10 people died as a result of a shell exploding at a trolley bus station. Theories about who is behind the bombing, which occurred only two weeks after a similar tragedy in nearby Volnovakha, vary greatly. According to the unrecognized Donetsk People’s Republic (DPR), mortar fire was carried out by a group of Ukrainian saboteurs, who have allegedly been apprehended. The Ukrainian Ministry of Defense distanced itself from the attack, Ukrainian Foreign Minister Pavlo Klimkin called the tragedy "our common grief," while Ukrainian Prime Minister Arseny Yatsenyuk announced: "Once again the terrorists committed a horrible act against humanity. And Russia bears responsibility for it." The only chance of preventing an escalation to the conflict is the plan of withdrawing heavy armament from the two armies' demarcation line, which was suggested during a meeting in Berlin between the foreign ministers of Russia, Ukraine, Germany and France. "The decision to withdraw heavy weaponry and possibly launch a peacekeeping mission aimed at separating the sides of the conflict must be taken as soon as possible, otherwise there will be conditions for further escalation, which is fraught with unpredictable consequences for both sides," said Sergei Utkin, Deputy Head of the Strategic Evaluation Faculty at the Center for Situation Analysis of the Russian Academy of Sciences. The centrist newspaper Nezavisimaya Gazeta reports that the Cooperation and Integration Agreement between the disputed South Ossetian Republic and the Russian Federation published in South Ossetian mass media has evoked a mixed reaction in the republic. The agreement provides for increased economic and security cooperation between Russia and South Ossetia, but does not envisage the possibility of the republic becoming a part of Russia. Members of the United Ossetia Party, which has the majority of seats in the local parliament, expressed their dissatisfaction with the agreement. A statement by the party said that, "the agreement does not respond to South Ossetia's aims of profound integration with the Russian Federation, as well as to national security interests and the republic's social-economic development." Both Russian and South Ossetian experts believe that the new intergovernmental agreement will evoke a sharply negative reaction from Georgia, but "there will not be any serious provocations from Georgia, since they would be a challenge not so much to Tskhinvali, the capital of South Ossetia, but to Moscow." Kosta Dzugaev, an expert from Tskhinvali, told Nezavisimaya Gazeta that there would be an inevitable reaction from Tbilisi concerning the signing of the Cooperation Agreement between Russia and South Ossetia. "Georgia's nervous reaction is understandable, but I think that in general the agreement will provide stability for our region since it is aimed at strengthening Russia's presence," Dzugaev concluded. The pro-government news outlet Vzglyad writes that cooperation between China and Russia has only accelerated in the last year as a result of the cooling in relations between the U.S., the EU and Russia due to the conflict in Ukraine. China is ready to build a high-speed railroad linking Beijing and Moscow via Kazakhstan with a price tag of $242 billion. The total length of the railroad will be more than 7,000 kilometers and the travel time will be two days (currently travel time between the Russian and Chinese capitals is a little over six days). Experts maintain that China's technology is comparable to Europe’s, where Russia bought its Sapsan trains (Sapsan was built by German firm Siemans), and China definitely has more money. What is the future of this project of the century? "If the Chinese build at least one railroad in Russia, at least to Khabarovsk or Vladivostok, they will have a chance to surpass their competitors from Germany, whose technology is noticeably inferior to that of the Chinese, which in turn is based on more advanced French and Japanese technology," says Georgy Vashchenko from Freedom Finance.